If you love to tan indoors, you’ve heard of Ed Hardy tanning lotions. Salons across the nation carry them and recommend them to clients. We’ve pulled together a selection of some of the most popular ones to review today. Let’s take a closer look. Ed Hardy’s Exclusive Collection of tanning lotions is designed to break tanning plateaus so you can develop a deeper tan. They also contain color protectors to keep tattoos from fading. 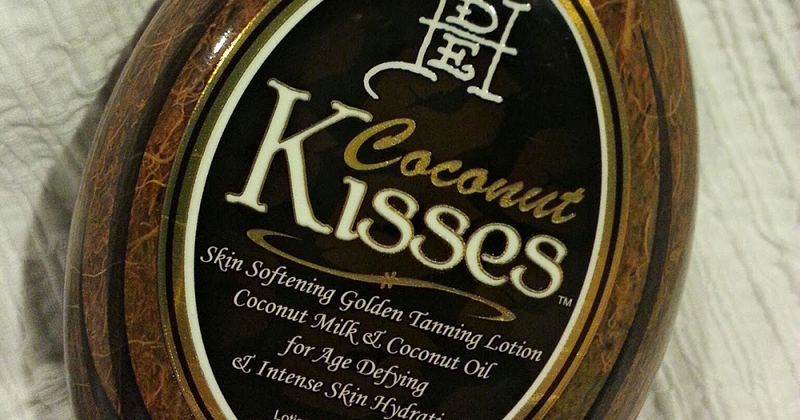 Coconut Kisses is one of the best known and most popular Ed Hardy lotions. Most users find the scent appealing. The formula helps even the palest tanners achieve a sun-kissed glow and healthy appearance even though there is no bronzer. Ed Hardy explains that there are a few main components that create the accelerated tanning effect. The first is their proprietary Melactiva plus MelanoBronze and Quad Tyrosine Blend that increase melanain production in skin. The Nouritan helps skin make even more tyrosine on its own so that a tan lasts longer, while the Body Fit blend makes cellulite less obvious by firming skin tone. There are also ingredients to protect the ink in tattoos from fading in UV light (although tanning with brand-new tattoos is not recommended), and a skin-nourishing mix of coconut oil, coconut milk, and cocoa butter. Hydration is very important in helping a tan develop and keeping it for as long as possible. A quick glance at the list of ingredients reveals that Coconut Kisses also has aloe, Vitamin E, and several herbal extracts. Tanners with sensitive skin should test it on a small area before applying it all over their bodies because there are a few irritants like parabens and propylene glycol. The Body Shots Double Shot comes with a warning that it has “extreme hot tingle.” Advanced tanners will love the plateau-breaking heat that causes frenetic melanin production. The combination of DHA and bronzers means it makes the wearer look instantly tan, and the color will deepen over the next few hours. The silicone emulsion protects moisture in skin, while the Advanced Matrixyl Sythe 6 blend tightens and tones to fight signs of aging. This formula also contains the Ed Hardy Tattoo and Color Fade Protector. The Elixir is another silicone-based tanning lotion with DHA and bronzers plus tattoo fade protection. It works well for light-skinned users, especially those concerned with the damage UV rays inflict. The Ideal Lift and Body Fit Technology firms skin to reduce cellulite and create better tone. The Subliskin blend fights spots and wrinkles plus it strengthens the skin’s natural barrier against moisture loss. Ed Hardy’s Premier Collection is for tanners on a budget who want the best product they can afford. Each lotion has MelanoBronze to stimulate melanin production so skin darkens faster. These lotions also contain anti-oxidants and skin softeners to protect, hydrate, and repair. The Hollywood Bronze lotion has dark bronzers that make skin instantly appear tan. Users like the fact that simply applying it makes their skin soft and glowing. It has both hemp seed oil and cocoa butter for rich moisturization and skin repair, plus cranberry seed oil to neutralize free radicals that cause aging. The Obnoxious lotion is exactly what you’d expect—a very hot tingle formula with both instant and delayed bronzing. Don’t let the sweet Mango fragrance fool you into thinking that is a soothing blend of ingredients. While it has plenty of moisturizing ingredients like hemp seed oil and antioxidants like Vitamins C and E, users say you will feel the burn. Be careful after tanning to avoid touching infants and pets for a few hours as the tingle can transfer to them. The Peace & Harmony blend might be what you need if your skin is showing its age or is sensitive to tanning lotions. It’s packed full of ingredients that soften skin and help erase wrinkles and sag. It has caffeine and green tea extracts as well as a cotton and rice formula that’s very soothing. While it has the MelanoBronze blend to energize melanin production, it doesn’t have some of the irritating ingredients found in other tanning lotions. Peace & Harmony avoids gluten, oils, nuts, and parabens. Tanovations lotions include Advanced Matrixyl Sythe to reduce fine lines and wrinkles, plus they have a double melanin stimulant blend for deep, fast tanning. Tahitian Bronze doesn’t have DHA and it won’t turn you orange or streak your skin. Instead, it has ultra-rich Argan and hemp seed oils to protect and moisturize, plus other anti-aging ingredients. Users say they appreciate that there is no after-tanning odor when they use this lotion. The Love Queen is a warming lotion. A warming lotion doesn’t tingle or burn, it simply gently raises the circulation so you feel an increase in temperature. As a result, your tan may come on stronger. Experienced tanners who don’t like tingle lotions but desire a deeper color may have success with the Love Queen. The formula contains MelanoBronze and Melactiva to increase skin pigmentation, plus it has DHA and dark bronzers to create a sun-kissed look that deepens over the first few hours after the lotion is applied. But tanning can be hard on skin, so Ed Hardy includes other helpful ingredients like aloe, cucumber, and hemp seed oil to heal and protect against signs of aging. Once you’ve got a great base tan, you can go darker with Black Reserve. It has super deep bronzers that you’ll need to wash off your hands right after applying it. Besides the instant bronzers, the formula also contains melanin stimulators MelanoBronze and Melactiva. To maintain the deep, dark tan you’ll get, Ed Hardy included hemp seed oil to keep skin hydrated. The number one way to extend the life of your tan is to use a moisturizer every day so your skin stays healthy and soft. Gentle skin cleansers that don’t strip away your natural oils also help you retain that sun-kissed glow. Ink is a hypoallergenic moisturizer that will extend your tan and save your tattoos from fading. It’s based on shea butter to make your skin silky without feeling greasy. The Lotus Extract and Vitamins C and E keep wrinkles away while the Body Fit blend makes skin firmer. The Extreme Dark Tanning Spray Oil contains walnut oil and Vitamin E to darken skin and protect it. This has the dual purpose of making the deep bronze you got from tanning last longer while nourishing and hydrating your skin. It’s packaged in a spray bottle so it’s ready to use. Did you know that if a Caucasian person has a good tan, it is approximately equal to SPF 4 protection against UV rays? This good bronze will allow that person to remain out in the sun up to 4x longer than someone without a tan before they burn. What is a sunburn? It’s not the precursor to a tan. It’s damaging to skin, and not just because it stings. The tiny blood vessels in skin burst when skin can’t handle any more UV rays. Down the road, getting burned could lead to developing skin cancer. That’s why tanning in short sessions without burning is much safer than laying out for too long. Tans usually don’t last longer than one month, even with tan extenders. That’s how long it takes the skin’s epidermis to renew itself. We hope you discovered the perfect Ed Hardy tanning product today. Come visit us again soon to view reviews of the latest and best in beauty and skin care.